The ECM-AW4 Bluetooth Wireless Microphone System from Sony is a complete battery-powered Bluetooth wireless microphone system. It plugs into virtually any kind of video camera, DSLR, or recording device that features a 3.5mm mini-jack microphone input. The transmitter has a built-in mic, or you can use a separately available external mic with 3.5mm output (Plugin Power supported). Receiver unit has a talk-back function that allows the camera operator to communicate clearly with the subject. The mic has a range of up to 150 feet. This mic system allows a subject and a device operator to communicate, eliminating the need for a separate intercom system. In this way the camera operator can act as a director, giving direction or suggesting interview questions to the onscreen talent, even if they are out of ear shot. A 3.5mm headphone jack/audio output is provided on both the transmitter and the receiver to facilitate this feature. For mounting or wearing the microphone and receiver, a belt clip and an arm band are included. The arm band enables you to attach the transmitter to a subject that is wearing clothing that cannot accommodate a belt clip. An included carrying pouch will help to protect the transmitter. Box Dimensions (LxWxH) 8.425 x 5.276 x 2.205"
ECM-AW4 Bluetooth Wireless Microphone System is rated 3.9 out of 5 by 41. Rated 4 out of 5 by Remektek from Great for single wireless speech usage I already had a Sony ECMW1M for a consumer Sony camcorder, and had found that to be very useful and cost effective. My new semi-pro camcorder, however didn't work with that device, so I bought universal ECM-AW4, which will work with any recorder that can take a 3.5mm (1/8th) jack audio input.The device is dead easy to use and provides bi-directional audio comms, so that the cameraman is able to talk to the talent and give directions via an earpiece that the talent can plug into the remote mic. Very handy.Only downside compared to the dearer devices, is that you can really only use ONE mic, so not suitable for mic-ing 2 or more people simultaniously.If that is acceptable, then I can highly recommend this device. Rated 3 out of 5 by Ryan S. from Promising but not perfect, Keep your cans on. Considering the price point for this wireless mic, it's not too shocking that there are some short comings. I also got it from a great daily deal here on B&H so I am not complaining, just helping others understand the limitations that I found. So here's what I've found from the VERY brief experience I've had from my first project with them.1) Pickup range is basically within about 12 of the mic. It's not something you could easily have attached to a waist belt without using another lav plugged in. And it looks pretty ridiculous to have a glowing blue light coming from your subject, even if you could get over the fact that you'd have a small black cylinder hanging from a shirt. 2) Using two of these sets near each other can cause some interference. Keep the two transmitters at least 2-3' away from each other. 3) When using 1 set, be mindful of drops in the signal. Since they are digital you won't loose quality, you'll just notice it cut out for a 1/4 or 1/2 second of silence. If this is being used for an interview, keep this in mind and keep your studio monitors on to make sure you didn't have a glitch during important sentences.4) Battery life was certainly long lasting through a 60 minute session, but I can't attest to longer.5) The unit picks up TONS of contact noise from anything that rubs against the plastic body. Don't rely on the mic in the body, unless you're ok with it being 100% visible. It's not a microphone you can hide under clothing while relying on the built in microphone. It works fine with a $- Audiotechnica wired lav but you'll end up with a lot of extra wire to manage (which isn't the end of the world if you have a cable tie.6) When testing out the 2-way communication feature) The audio quality from the transmitter is 100% better than the audio from the receiver. Considering that you don't even have an alternative product in this price point, I can't complain. However don't rely on it as a second microphone plugged into a separate recorder. (the quality from the receiver just isn't that good). Perhaps. If you needed a safety recording it COULD do in a pinch. 7) If you plan to use the 2-way feature. there is a 1/2 second delay in the signal and I would plan on using something far more inconspicuous like one of those CIA ear buds with the clear tube wrapped around the ear. Rated 1 out of 5 by Zachary B. from I can't stand it! I understand these are not some of your more expensive mic units out there but so far I hate them. The audio coming through my DSLR is so HISSY that if it wasn't for post production, the audio would be completely unusable. Using a Canon T6i if anyone is wondering. The other thing I hate about this is the packaging included 4 (FOUR) operation manuals for every language known to man but failed to adequately explain how to properly operate the mic. It was so frustrating trying to read these instructions that I just gave up and went looking for a youtube video that showed how they hooked up. RIDICULOUS! Rated 4 out of 5 by Daniel from Works well, with some nice features This wireless mic system does what it is supposed to and does it remarkably well. The sound is quite good and is just about professional quality. The (plastic) build quality is adequate for light to moderate use. This is not a professional system but is really quite good, especially for the cost. Four very nice features are the small size of each component, the fact that each is powered by one AAA battery, the talk-back function, meaning that the videographer can talk to and direct the talent, and the included equipment (earbuds, connecting cables, and carrying bag). The wireless range is quite good, and the components easily pair via Bluetooth.I give the system 4 stars (not 5) only because of the plastic construction. But treat this system well, and it should give you very good service. Rated 5 out of 5 by dodik from SMALL BUT INVINCIBLE I bought this product to record music sung by our cantor in the church. I used my computer to attach the receiver and about 3 meters away, I placed the microphone on a microphone stand. The cantor sang at about 1 meter away from the microphone. The place was a huge open area. The result of the recording was unbelievable. The microphone picked up the sound very clear. The noise was subdued. The only downside of this product is you cannot determine the volume of the microphone and the receiver. Rated 5 out of 5 by Steve from Great Wireless Product! Purchased this unit specifically for the bluetooth wireless format for my AX-100 Sony 4K camera microphone input. I also have a Sony bluetooth pair ECM-W1M where the receiver is mounted on the Multi-Interface shoe. This ECM-AW4 is very flexible because you can use it with the cameras microphone input jack which I need on my other cams that don't have a Multi-Interface shoe. Another great thing is that these units can be just used as a wireless communication device with another person. The sound quality is great and the range and speed of connection is very good. Battery life is also very good. Rated 3 out of 5 by Regretful from The truth I don't know what product these other guys were rating but these things are not worth the money. The sound quality is only good at a very short line of sight. They feel cheap and their light weight plastic. (Dont drop it). And the ear buds they provide are worse then those things the airport provide for an in flight movie. Save your money and get something better. Rated 3 out of 5 by dannygrizzle from Don't Yet Trust This Bluetooth Mic I bought two of these bluetooth mics after watching glowing reviews on YouTube. If they performed as well as the reviewers experience, they would be a great product at an amazing price. My primary application for this product is sound reinforcement, not video production. I own Sennheiser wireless mics for video production, so I can compare and contrast. For sound reinforcement, I tried to use these mics for speakers in front of a live audience. Not too successful. We got through the day, but I will be more careful in the future. My specific application was hourly breakout sessions, where topics and speakers change each hour in multiple meeting rooms. I experimented with an external lavalier plugged into the transmitter, but it was unwieldy. Part of what I need is a quick change, no fooling with the lav cable. My speakers often arrive in the presentation room at the moment their presentation begins, and there is no need to hide the transmitter in their clothing. This Sony seems ideal -- it only takes a second to clip it to a shirt or jacket. In reality, not so good. I didn't anticipate lady presenters with necklaces. The plastic mic body rattled noisily against their jewelry. These kinds of technical glitches don't help inexperienced presenters who are already nervous about speaking in public. Worse, and speaking to the specific of the product itself -- the mic is prone to feedback, and the bluetooth link introduces delay, sometimes very noticeably so. It is very disconcerting to speakers, and the audience, to have sync problems in a live presentation. Feedback is more a function of the room acoustics, something I can perhaps tune by loudspeaker placement or positioning. Frankly, a conventional cardiod mic like a Shure SM58 would be ideal, but my experience with conventional mics is dismal because I am working with non-professional speakers who are not accustomed to hearing their voice amplified, they all request no PA in the false belief that everyone can hear them (#1 complaint on our feedback forms I couldn't hear), and the speakers will sidestep a conventional mic and talk around the PA. So I am stuck on micing with lavaliers, which they can't get away from. The downside is omni pickups and feedback sensitivity. I write too much, but as a production mic, the application I saw reviewed on YouTube, I question if the sync delay issues I experienced in a live application are a deal killer. There does not seem to be a fixed delay, but rather some kind of digital buffer that varies as bluetooth digital data is transmitted. BTW - I was experiencing this when my transmitter and receiver were never more than 20 feet apart with full line of sight. There were no other bluetooth devices in the room, unless someone in the audience was wearing a cell phone earset. Would not seem to be challenging circumstances. A final reservation I have about this mic system is the jacks, which are simple 1/8 inch TRS, no different than a mini headphone connector. This is definitely amateur/prosumer gear, subject to reliability issues with connecting cables. I want very badly for these mics to work, and they seem like such a great idea, and a reasonable price for someone doing business meetings. But if they don't work transparantly and create a lot of distractions for presenters, I can't use them. I have not given up yet, but my first day's use did not go smoothly. Is the receiver output mic level or line level? The output is mic level (for connecting to mic inputs on a camera or recorder). How many devices will this connect to? I need a microphone to connect to up to 50 devices. They will only connect to each other. The instruction manual for the Sony ECM-AW4 Bluetooth Wireless Microphone System states that the receiver and the microphone are factory-set to communicate with each other. Communication is not possible with a receiver and microphone not sold as a pair, multiple microphones, or any other Bluetooth device such as a smartphone, computer, etc. As the units only work in pairs, you may not use them simultaneously for usage on multiple units. Does it work with Canon XA30? Why no sound recorded when plug to Mic, Input 1 or Input 2 ? Please help. Make sure you are plugging in the receiver (not the transmitter) into your audio in jack. It should work. Try all inputs until you get it to work. If it does not, try a different microphone to make sure your camera is working correctly and check its setting to accept a mic in. Use a headphone on the receiver; are you getting sound? If not, you have a defective product. Hi, I would like to use such Bluetooth Wireless Microphone System for my Samsung Note 4 phone. Is it compatible? i have not been able to make the mike work with a phone or computer. 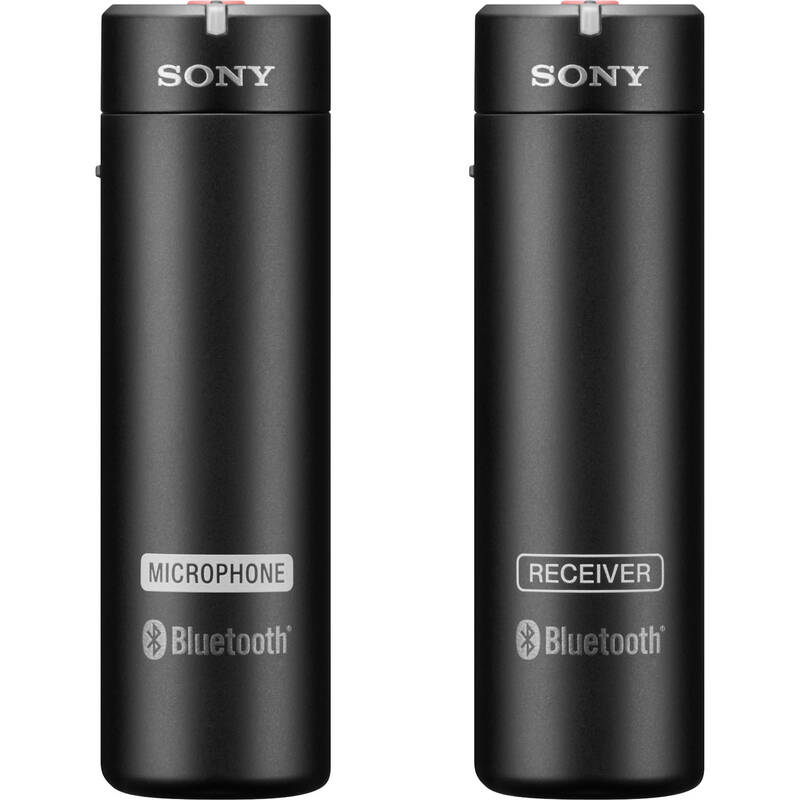 this is a sony bluetooth product and it can carry a signal a couple hundred feet. i don't think it is you standard bluetooth frequency and sony makes no claims that it would work this way. i think it is proprietary system. Will it work with canon 80d? Can I use 2 sets of Sony ECM AW4 concurrently in a 2 persons interview? Asked by: Chun Siew L.
Try with split Mono plug into microphone and 2 lavaliers Mics! Answered by: Sandro Alejandro D.
compatible with A7II? anyone tried? Yes it does but don't expect miracles, poor sound quality, l was never able to get good sound from them . What kind of external mic will work for this product? I tried to plug in 2 different external lavelier mics and they did not work. any mic that does not require power, or has its own power source. I have added a rode shotgun mic with its own battery and it worked real well. I have a radio shack lav with internal battery and that works will too. I also have a lav that is dynamic and that works too.